An artist's interpretation of the GOCE satellite in orbit. A modified Russianballistic missile was scheduled for launch today with a $450 million Europeanprobe that will measure the tug of Earth's gravity with finer detail than everbefore. But the launch was scrubbed due to problems retracting the pad gantry.Liftoff could be attempted again Tuesday. Engineers were prepping amodified Russian ballistic missile for launch Monday with a $450million European probe that will measure the tug of Earth's gravity withfiner detail than ever before. The Gravity field andsteady-state Ocean Circulation Explorer, or GOCE, is bolted atop a Rockotlauncher at Complex 133 at the Plesetsk Cosmodrome in far northern Russia. Technicians loaded theRockot with toxic hydrazine and nitrogen tetroxide propellants this weekend.Workers also completed a series of electrical checks on the 95-foot-tallbooster, verifying it is ready for the final countdown on Monday. The Rockot is an SS-19missile built to deliver nuclear warheads to targets across the globe.Eurockot, a Germany-based launch services firm, will oversee the Monday'slaunch for the European Space Agency. Liftoff is set forprecisely 1421:17 GMT (10:21:17 a.m. EDT) Monday. The Russian statecommission will give its approval to proceed with launch about six hours beforeblastoff. Officialswill confirm their readiness for flight 40 minutes prior to launch. TheRockot's automatic launch sequence will begin a half-hour before liftoff. The pad's mobile servicetower will be wheeled away from the rocket and locked in launch position fourminutes before launch. Launch was postponedfrom September after rocket officials discovered a failure in the guidanceand navigation system of the Rockot's Breeze KM upper stage. Technicians had toreplace the rocket's gyroscope and refurbish its power system, delaying launchto this year. The silver rocket will turnnorth from Plesetsk and drop its missile-heritage first and second stages inthe Barents Sea within the first five minutes of the flight. The Breeze KM will igniteto for more than nine minutes to reach a temporary orbit with a high point of163 miles and a low point of 95 miles, according to Khrunichev, the Russiancontractor for the Rockot vehicle. The upper stage willbriefly fire again for 13 seconds at 1539 GMT to climb to a circular orbit withan altitude of 173 miles and an inclination of 96.7 degrees. The Rockot will deploy GOCEjust shy of 90 minutes after blastoff. Officials hope to confirm spacecraftseparation moments later after acquiring the first signals from GOCE through aground station in Kiruna, Sweden. Controllers will monitorthe launch from the European Space Operations Center in Darmstadt, Germany. 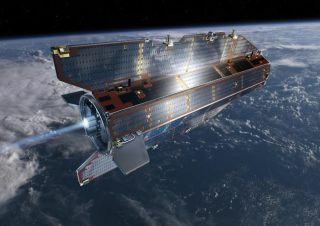 GOCE carries anultra-sensitive sensor to detect subtle variations in Earth's gravity field asit circles the planet in an unusually low orbit just 162 miles high. Accurate maps of thegravity field will give scientists a crucial reference to compare against oceancirculation and sea level measurements.